I first found my New England Spider Cake recipe in some magazine that I can’t credit because I cut out the recipe years ago without noting the source (based on typeface and memory I’m guessing it was the magazine that comes with the Sunday New York Times). It's now in regular rotation on the Family Favorites list. I've read that it's called Spider Cake because that's the name for the cast iron skillet it's baked in, and also that it's because the cream in the center creates cracks that look like spider legs (you be the judge). I’ve altered the original a bit based on my experience with another great recipe that I’ll also share from The Art of Low-Calorie Cooking by Sally Schneider , a beautifully illustrated book of scrumptious recipes that represent no sacrifice whatsoever in flavor. Key to both recipes is a well-seasoned cast-iron pan or skillet around 8-9-10 inches square, or a round 12-inch skillet. I’m not one of those authoritarian cooks who says you can’t use what you have on hand; you’ll just give up an extra crispiness to the outer surface that’s worth the effort to get a skillet and season it. Preheat oven to 400 degrees. Set the cast-iron skillet in the oven while it heats. Combine cornmeal, flour, sugar, baking soda, and salt, Whisk eggs into the buttermilk or soured milk. Stir into dry ingredients. Pour the oil or butter into the now-hot skillet and swirl it around to coat the bottom and sides. Pour in the batter and enjoy the satisfying crackle as it hits the hot pan. Pour most of the cream into the center. I like to add another dollop centered in each of the four quarters of the pan. 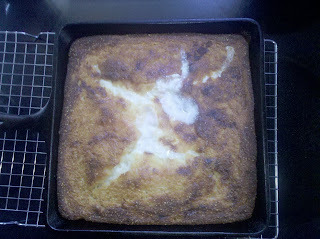 The cream creates a puddinglike consistency when it’s baked and will throw off your usual toothpick test for doneness. Put the skillet into the pan and bake until golden brown on top, around 45 minutes. KEY ITEM: If your oven browns too fast at 400 degrees, cover the top with foil after it has set up a bit (so the foil won’t stick to the batter). The picture here illustrates just what happens if you get too busy writing a blog post and neglect this step. This is absolutely fabulous served for breakfast with maple syrup. Preheat oven to 450 degrees and put 10-inch skillet in to heat with the oven. Combine cornmeal, salt and baking soda, Whisk together buttermilk and egg, then mix buttermilk mixture into the cornmeal and stir just until combined. Pour the canola oil into the pan and swirl around to coat bottom and sides. Pour batter into the pan and shake slightly to spread ev enly. Bake until the bread is set and a knife or toothpick inserted into the center comes out clean—around 10-15 minutes. 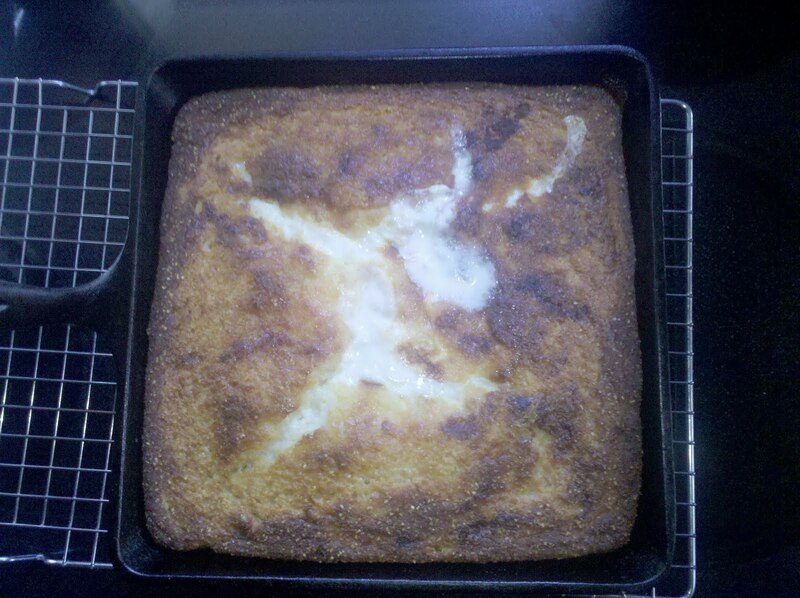 I have also successfully doubled this recipe for a thicker cornbread in the same pan size. It takes closer to 40-45 minutes to cook and you’ll definitely have to cover the top with foil to prevent over-browning. Tolerance. Thanks to Heath's comment on Essentials I, this got added as a mental essential for bike commuting. It tastes even better if you season it with a big dash of humor. He's absolutely right--you have to be tolerant of those people at work who look at you like you're crazy (especially on days that are on the rainy or cold side). 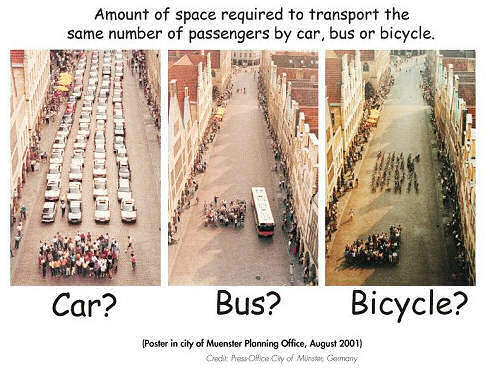 You might point them to my post that compares the hassle factor of bike commuting compared with driving (although it makes more sense to someone who's been through the complete psychological conversion process :D). You also have to be tolerant of drivers who tell you all their stories about bad bikers--those sidewalk-terrorizing, helmetless scofflaws (or just cyclists who take the lane as they're legally entitled to). If you ride the Centennial Trail you'll encounter pedestrians with baby strollers who think the "wheels only" lane in Riverfront Park is for them, people who are positive(ly wrong) their unleashed dogs are perfectly polite and would never take a chunk out of a passing cyclist, toddlers who zig when their parents think they're going to zag, rude cyclists who whiz past without yelling "left!" to let you know they're sneaking up behind you, and other joys of sharing a public space. Tolerance. Tolerance. Tolerance. We're all in this together. Persistence. You can’t try this bike thing once and then quit. After all, that’s not how you learned to ride a bike in the first place. On the other hand, maybe your first few trips will be delightful and you’ll figure they’re all going to be like that. No, honey, they’re not. Sometimes a grouchy driver does honk and yell at you to get on the sidewalk. (Please don’t.) Sometimes you leave in the morning on a beautiful sunny day and ride home in the afternoon in a cloudburst (or you get smart and throw your bike onto the rack on an STA bus to ride home in dry comfort). You get a flat tire (and realize that the ability to fix a flat is one of the great empowerment moments riding a bike offers--it's a lot easier than on your car). But if you keep riding you’ll experience a transformation. You'll find you're a lot more comfortable with the vagaries of weather than when you were safely insulated in a cocoon. You'll be more aware of your neighborhood and your surroundings. You’ll see the world differently. You’re a bike commuter. Tolerance and a sense of humor. Persistence. Comradeship. Creative thinking. Openness to new things. Friendliness. Willingness to take some risks. Huh. This isn’t a bad list for life in general. Amazing what you learn from the vantage point of a bike saddle. Essentials I: Willingness to take some risks. Trustworthiness. Essentials II: Friendliness. Openness to new things. Do I exercise? Sure I do! First thing every morning. Up, down, up, down. Okay, boy, now let's try the other eyelid. This series is about the mental attitudes that will help you with your bike commuting. Friendliness. Smiling at drivers and making eye contact makes a big difference when you’re between them and their destination (see above). Whenever you make eye contact you’re making the point that we’re all in this together. You’re another human being, not a speed bump to be run over. This is also one of the great joys of bike commuting. I smile at people as I pass them and they smile back. I’ve given directions to I don’t know how many bewildered drivers trying to sort out Spokane’s downtown one-way streets. After all, I’m accessible because I’m on a bike. They can’t stop another driver to get help. I try to think of myself as an ambassador for bike commuters. My job is to make friends, not enemies. Openness to new things. This is a biggie. What will it take for you to change your mindset? We all have our excuses about why we can’t change. I get to hear a lot of those from people overcome by pangs of guilt when I come into a meeting with my helmet and panniers. You’re just used to driving. You have a habit. Habits can be changed. Once upon a time our mothers all cooked with Crisco, right? Now you know about trans-fats and other scary things and you use canola or olive oil. You may not even be frying things any more. And it turned out that grilled food tastes pretty good, doesn’t it? You can actually taste the food, not the thick greasy coating. New things. Try ‘em, you’ll like ‘em. This series of posts isn’t what you think. No mention of helmets, lights, reflective/high-visibility clothing, fenders for rainy days. Instead this is my take on the other essentials for bike commuting: the mental ones. It would be too long as one post so I’m going to stretch it out over several days to get your brain all warmed up for Bike to Work Week May 16-22. Willingness to take some risks. I’m not talking about deliberately playing in traffic or riding the wrong way on a one-way street—no stupid risks. I mean the willingness to swallow hard and take the lane when the road narrows and you need to keep going. The drivers behind you can wait. They’re supposed to—it’s the law. They’d have to wait if you were a big truck using both lanes to make a right hand turn, a bus stopping to let off or pick up passengers, someone in a wheelchair crossing the street. We all need to get over the notion that being in traffic somehow guarantees you the right to an unimpeded flow from starting point to destination. Never has, never will. Traffic is a game of physics—or maybe pinball—with people bouncing around like particles pushed by various forces. Whether it’s a string of red lights as people jam on their brakes because of an accident, or a cyclist slowing down on a steep hill, traffic will always move more like an accordion than like an arrow. Trustworthiness. This is the flip side of risk-taking. 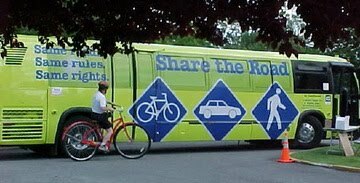 I already blogged about this at Cycling Spokane but it bears repeating: You’re safer when drivers, pedestrians and other cyclists can trust you to behave consistently. Are you predictable? Can I count on you? If you’re biking in the right-hand tire track of the lane (a good position much of the time) will you stay there and not veer into the parking spots that are empty for a block, then dodge back out into the flow of traffic? Will you stay in the lane and not jump up onto the sidewalk for a stretch, startling pedestrians and disappearing from the driver’s view until you pop back out at a light? Think about how can be as trustworthy as possible for other travelers around you. You’ll be safer and so will they. Do we REALLY need all the new resources that provide useful information - when it comes as interruption to our goals? By this I mean higher thinking vs over-focusing on trivial to useless information? Do you think reading Twitter stream every day makes you smarter or dumber? The same day, I read a blog post from Zen Habits on the six gifts we can give our loved ones of presence, love, compassion, voice, healthy lifestyle, and belief in them (don’t just read the list of words here—go read the post. Just don’t forget to come back). The combination of these two inputs made me think about the amount and type of input I receive—and what my output looks like. Am I present in these spaces, as well as for my family? If not, I shouldn’t waste my time and yours. But it’s really, really tough to be present—in the sense of being mindful and aware—in the online medium that invites you every nano-second to click away to another bright, shiny new toy. You only learn social media by doing: reading and commenting on blog posts, setting up a Facebook page and finding friends, starting a blog (which I did with no clear idea of its voice or purpose—definitely something to do differently the next time), creating a Twitter account/finding people to follow/attracting followers. This is professional development for me, keeping up on the latest communication tools. Doing all this as an individual let me learn before applying the lessons to my institution so the mistakes are in my name, not theirs. Drinking from a firehose is time-consuming. There’s just no way to accomplish this in a standard 40-hour work week; I spend plenty of late nights and weekends. As I noted a year ago, I tend to take on an overload when I plunge into something anyway. I’ve brought that same intensity to my social media explorations. I didn’t just focus on the main channel, whatever that might be—Facebook? Blog? Twitter? I checked out all the tributaries with the same gusto. Or, you might say, I flitted like a hummingbird from flower to flower, sipping sipping sipping (although the attraction to shiny new objects makes me more magpie than hummingbird). The learning experience has been great. I’ve used the lessons for work—we won an award for my use of the Twitter account @WSUSpokane as an identity-building tool and I was named a Senior Fellow of the Society for New Communications Research. I’ve also built some online presence for the volunteer organizations I love like Bike to Work Spokane. I became an invited blogger—love the sound of that—on Cycling Spokane. I now speak regularly at local and regional conferences on Twitter and other uses of social media. I even got interviewed on Gov 2.0 radio. In the year since I read those tweets and that post, the reasons to be thoughtful about inputs and outputs have only increased. I’ve subscribed to and unsubscribed from quite a few blogs, seeking the right mix of creative inspiration, fresh insights, and a manageable Google Reader queue. I keep making another run at using LinkedIn more effectively to find resources and connect with people—I know it has value I haven’t found because I haven’t put in the time. One of these days maybe I’ll really start utilizing LaunchPadINW, the local social network. What I’m trying to do in all these spaces is be more thoughtful about whether I’m truly adding value when I tweet or post versus just distributing random mist. A sense that I’m adding value will keep the firehose manageable for me. Mindfulness is the secret. 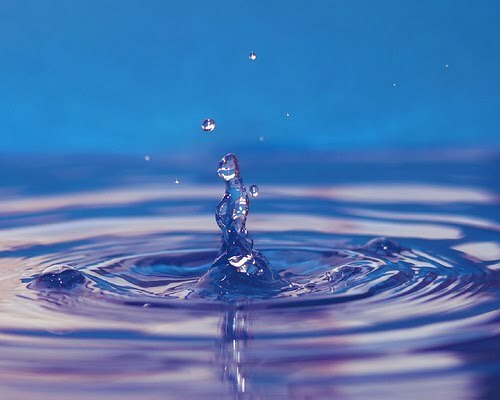 The tweets that just pop out like a flood—say, when I’m live-tweeting a conference—aren’t mindful ones. If I’m making a conscious decision about whether or not to subscribe, follow or tweet, it will mean I’m aware and present in the moment. That will slow me down. This question of value will continue to grow in importance for all of us as the volume just continues to increase. Otherwise how will our little drops of water jump out above the torrent and get noticed? Bearing in mind, that is, that our sense of being separate droplets is an illusion. We’re all the ocean. I’ve already written about the shift in perspective I’ve experienced that makes me view driving as a nest of factors that cost me time, money and frustration. I thought I’d break down my bike ride into a few more comparisons that come to mind once in a while on my morning or evening pedal. Your mileage may vary. In a car: Damn it! I almost caught that yellow light. I would have been able to arrive at work a full 120 seconds earlier if I hadn’t gotten stuck at this stupid light. On a bike: Oh, good, a chance to catch my breath. In a bus: Light? What light? I’m in the middle of a really exciting part of this book. In a car: Am I pushing the speed limit so much I’m going to get caught? Those tickets are expensive. On a bike: I feel so strong! I’m flying along at almost 25 miles an hours and doing it all myself. This is exhilarating! And I’m not even going downhill. On a bus: Speed? What speed? I’m in the middle of a really exciting part of this book. In a car: Dang it! First I had to shovel the driveway just to get out. Then I had to shovel off the car and scrape the windshield. Now I’m going to rethink this whole “I don’t believe in studs because I don’t want to be part of the problem grinding down the city streets” thing. I’m not sure I can stop at the bottom of this hill. On a bike: So glad I switched to the bus—I don’t think that driver’s going to be able to stop at the bottom of this hill. On a bus: Snow? What snow? I’m in the middle of a really exciting part of this book. I’m just glad (or, I just wish) my neighbors shoveled their walks for the trek to the bus stop. In a car: Smells? What smells? All I get is the exhaust from that oil-burning smoke bomb in front of me. On a bike: The lilacs are in bloom! And the coffee roaster must be doing her thing today—I can smell the beans when I pass that block. Last night’s rain sure made everything smell fresh and clean. On a bus: Smells? What smells? I’m in the middle of a really exciting part of this book. Although that girl next to me really needs to learn the meaning of the word “subtle” when it comes to perfume. In a car: You know, if they made the speed limit here 35 instead of 30 I bet I could get to work faster. I could still stop in time if one of those pedestrians wanted to cross the street--it's not as if I'm going to kill someone or anything like that. On a bike: I love it when I can keep up with the speed limit. Especially when those cars that jack-rabbit through downtown have to stop at all the lights because they speed, and I can just catch up at each red light. On a bus: Speed limit? What speed limit? I’m about to finish this really exciting book. Then I’m going to check my email on my phone and delete the spam before I get to work. Oh, but there was that driver who zoomed by on my way to the bus stop--just glad I had time to jump back to the curb. I wish he knew that at 35mph, he's twice as likely to kill someone as he is at 30. In a car: Shoot, there's nothing close to my building. I'm going to have to look for a spot and that's going to make me late to my meeting. Wonder if I have change for the meter? On a bike: I'll just hitch to that sign and be inside in a jif. On a bus: Parking? What parking? Not my problem. I think I'll stop by the library in this little gap between buses and get another book to read. Twenty minutes is just right for me to squeeze in one errand before heading home and I'll have a nice walk to boot. In a car: Happiness? What does commuting have to do with happiness? This is the worst part of my day (and there's research to support this). On a bike: I love riding my bike! On a bus: Happiness is a good book and time to read it. Inspired by Jonah Lehrer's post and comments on commuting and happiness, Matthew Yglesias's post on congestion pricing, and the smell of roasting coffee on my ride to work. Read this post by Christopher Penn (@cspenn) and this post by Olivier Blanchard (@thebrandbuilder), then come back. With one exception noted below, these are right in line with what I do to feel happier and healthier. In fact, they were so good it was hard to come up with 11 new points here…. Give the gift of time to things you care about. It’s easy to click a link to “like” someone’s statement on Facebook, become a fan of a page endorsing a political position, or hit the retweet button on Twitter. It’s more difficult to haul yourself down to City Hall to testify or show up for thankless committee meetings for a fundraiser to help feed people. Your effort input provides one of the multipliers in the psychic reward calculation: More in means more out. If you’re motivated by payback in the form of a paycheck, consider that you might end up connecting with a job working on whatever it is you care about through establishment of a reputation as a hard-working volunteer. Choose to be amused. Life is full of warts, wrinkles and speed bumps, any one of which can trigger grumping and growling. Or it can trigger a wry smile, a shrug, and an “Oh well, things happen.” Entirely up to you. Laughing is a whole lot more fun than sobbing any day of the week. Eat vegetarian. You may not want to become a vegetarian the way I did several years ago, but by making room on your plate for more plant fiber and less muscle fiber, you’ll lose weight (if you don’t go crazy on the cheese sauce), lower your fat intake, cholesterol and blood pressure, decrease the size of your carbon footprint, and discover amazing new taste sensations. Your mom will be proud, too. While you’re at it, eat real food. I already blogged about this, inspired by Michael Pollan’s In Defense of Food. If you’re eating meat, buy it from someone you can look in the eye and get meat that doesn’t give you a dose of antibiotics and growth hormones. Shop the outside edge of the grocery store and you’ll cut down (way down) on cost, sodium, weird chemical-ly additives you can’t pronounce and don’t understand, and packaging waste that you pay to have hauled away from your house. Ride a bike. Regain the feeling of freedom you had as a kid, when those two wheels meant you could get somewhere under your own power instead of waiting around for an adult with car keys. Even if you don’t make it your primary form of transportation, you’ll probably be amazed to learn how many destinations lie within a mile or two of your home if you live anywhere in or near a town. (If you live in the ‘burbs you might have to go a little farther to find a destination—that’s a choice you made. But little coffee shops and your local library might well make a pleasant loop on a Saturday afternoon.) Sure, you can walk—I’m all for walking—but if you’re the impatient type you’ll appreciate how much farther and faster you can go on a bike. Schedule time with friends. That’s right, I said “schedule.” If you leave it to chance your calendar will fill up. So don’t leave it to chance. I had the incredibly sad experience recently of losing a dear friend who was far too young. I literally had her name on a list in my Outlook Tasks (yes, I’m serious) labeled “Set coffee or lunch” because I hadn’t seen her in a while. I was too late. She was inspiration for a girlfriend group I started up years ago that’s still going strong and so many of them have said how much they like having a regular time on the calendar to sit and talk. Make a commitment. You love people. Tell them. We tend to reserve “I love you” for our romantic attachments. If you’re like me, there are special people in your life you love for all the gifts they’ve given you: understanding, a sympathetic ear, advice that grounds you in who you are, side-splitting gut-busting laughter, late-night discussions over a glass of something nice. Yes, it took the death of a friend to remind me of how short life is. Don’t pass on chances to tell people you care about how deeply you appreciate having them in your life. Sing even if you’re lousy. I’m betting it’s been a while since you sang just because you felt like it. Don’t be shy. Unless you’re regular in attendance at some sort of religious service or you get paid for your awesome pipes, you probably have few occasions to sing. Some people sing along with a radio or iPod—that totally counts since I can never remember all the lyrics to songs I think I know. I live with two daughters who have beautiful voices that leave me in awe when they sing. They did not get this ability from me. Nonetheless I sing (granted, sometimes with apologies for my unplanned key changes). Slow down. If you’re eating something delicious don’t fork it in as fast as possible. You’ll get more flavor sensations if you stop between bites. If you’re driving, time the difference in one of your usual trips between driving over the speed limit (you know you do it) and observing the speed limit all the way there. Bet you’re not cutting as many minutes off as you think you are. If you’re reading an amazing book (I’m really guilty of devouring books rapidly), stop a minute to reflect on how the author managed to create such vivid scenes. If you’re about to send an angry email—this one’s a biggie—stop, reread it, and think about how you’d feel if you were the recipient instead of the sender. Savor the flavor. Be kind. As I've said before, this is a lesson I learned from my mother. There is too little kindness in the world. Add to the supply. (Bonus item!) Create your own version of “what I did on my summer vacation” that does not involve electronic communication. Do it. I took a long blogging hiatus last year. The list of things I did instead of hanging out excessively online reflects my idea of the good life. You have your own. Live it. What possible rationale could anyone suggest with a straight face for designing streets that make it difficult to get to a bus stop, unsafe for a cyclist to share a lane with a driver, treacherous for truck drivers trying to make a delivery to a grocery store, impossible for someone in a wheelchair to travel a few blocks? That’s what we did, though. Complete streets are designed and operated to enable safe access for all users. That’s all. Streets for all of us. When you have complete streets pedestrians, bicyclists, motorists and transit riders of all ages and abilities can move safely along and across the street. Who thinks it’s a good idea to have street designs that encourage use of a car for the shortest of trips? 50% of all trips in metropolitan areas are three miles or less and 28% of all metropolitan trips are one mile or less – distances easy to walk, bike, or hop a bus. Yet 65% of the shortest trips are now made by automobile, in part because of incomplete streets that make it dangerous or unpleasant for other modes of travel. Who wants to make sure we don’t get the health benefits of walking or biking for transportation so we can keep packing on the pounds and ending up with diabetes, heart disease and premature death? Who wants to keep property values down by leaving streets and sidewalks unfinished and unpleasant for all users, instead of adding the connections that increase curb appeal as well as usability for everyone? Who wants everyone to drive a single-occupancy vehicle because we’ve made it too scary to ride a bike, too muddy or impossible to get to a bus stop because there are no sidewalks, too unthinkable to walk a mile? A really radical notion: streets for everyone.